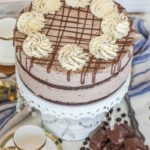 A chocolate mousse cake like you’ve never had before! 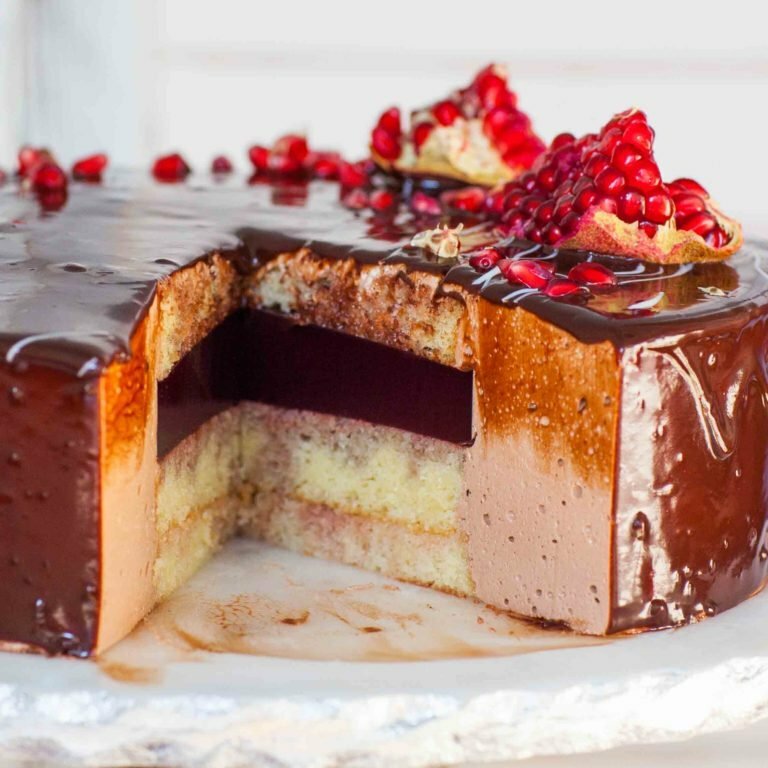 My Pomegranate Chocolate Mousse Cake is a real stunner, with layers of delicate sponge cake soaked with pomegranate liqueur with a center of pomegranate gelee. The chocolate mousse is simply heavenly and literally melts in your mouth! For the chocolate mousse recipe, I use my Russian Bird’s Milk recipe – more about that later! Every bite of this chocolate mousse cake is packed with incredible flavors that balance each other out: sweet, tangy and chocolatey! Watch my video for my step-by-step instructions! 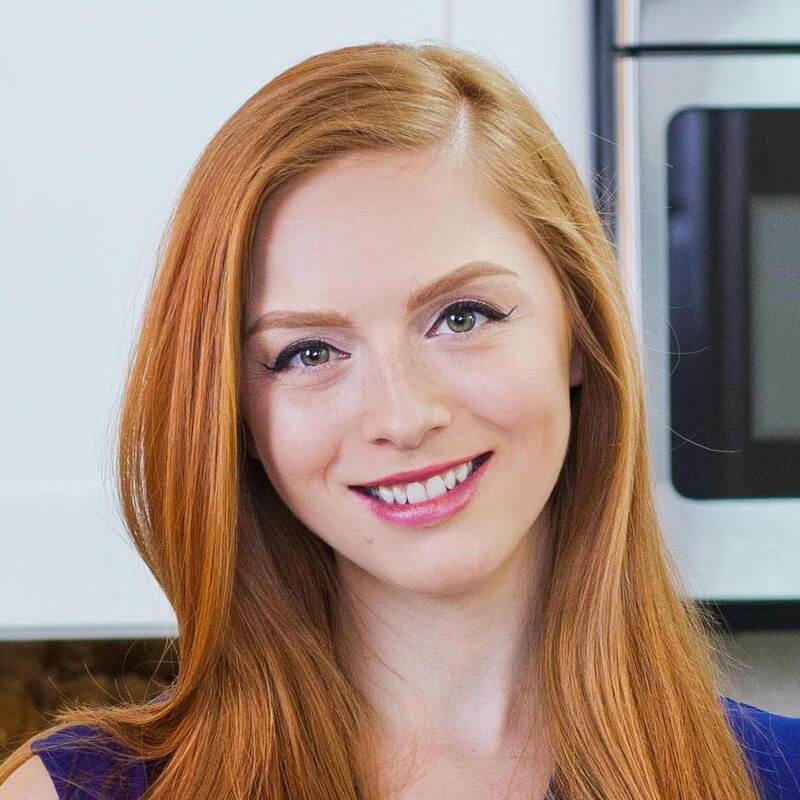 And if you want to get new recipe updates to your email, just subscribe to my YouTube channel! I came up with this chocolate mousse cake creation for the holiday season. I wanted to share something with my readers that would be the centerpiece for every holiday gathering and use in-season pomegranate. 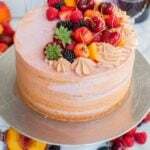 The layers in this pomegranate cake are simply stunning and look magical! I’ll definitely be making this many, many times this holiday season! 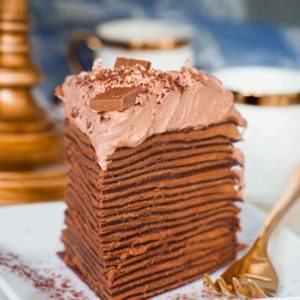 The mousse component of this cake is called ‘Bird’s Milk’ – a unique name for an incredibly delicious type of Russian cake. If you’ve never tried Russian ‘Bird’s Milk Torte’, you’re in for a real treat. 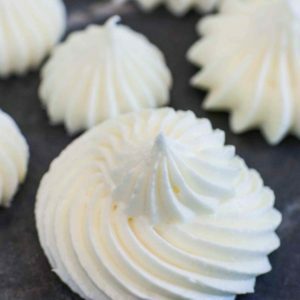 It’s the smoothest, silkiest, most incredible type of mousse – it melts in your mouth and tastes like a bit of heaven! The classic Russian cake version is made with vanilla mousse and a simple chocolate glaze. 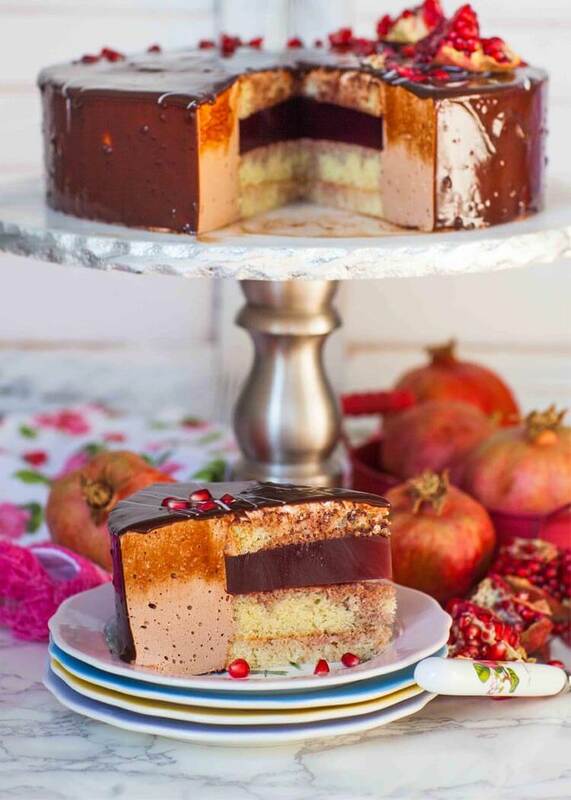 My chocolate mousse cake version with pomegranate flavor takes the traditional version to a whole new level! This chocolate mousse recipe calls for agar gelatin – it’s a plant based gelatin that sets at room temperature. I buy mine on Amazon – linked below! Regular gelatin would work, too but you would need to at least double the amount to ensure the cake sets properly. The chocolate mousse is hiding a secret inside! 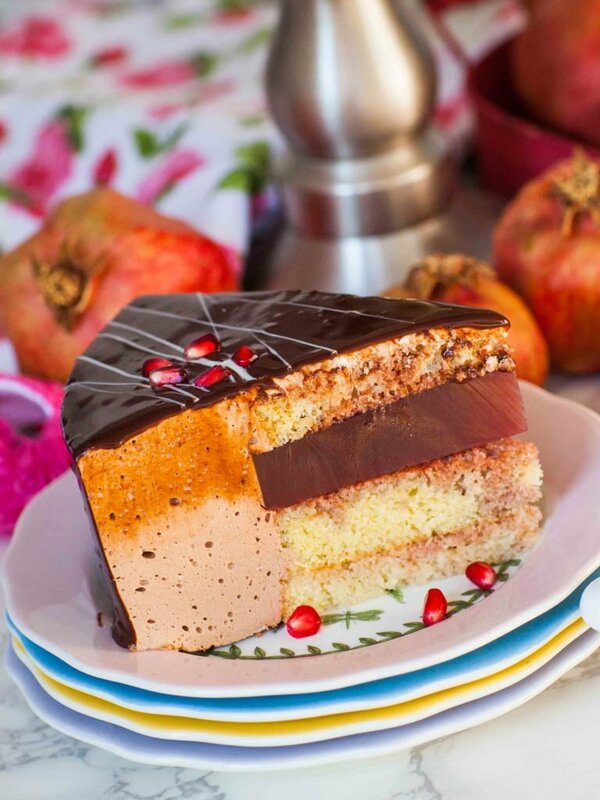 Inside, there is delicate sponge cake soaked with pomegranate liqueur and a pomegranate gelee center and a shiny chocolate glaze to finish the cake! For the sponge cake, I prepared a small batch of my classic sponge cake recipe. 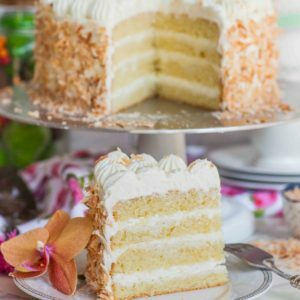 It’s super easy to make and perfect for this type of cake. The pomegranate liqueur soaks right into the cake layers and adds incredible fruity flavor, along with the pomegranate gelee center. Next time, try this ‘Caramel Raspberry Mousse Cake’ with a raspberry center! Here’s a 6-inch cake pan for the center layers. And a large spring form pan for the main cake. I get my acetate cake collar in a bulk roll then cut it down to size for each cake. I love both my handheld KitchenAid and my classic stand mixer. I also get my agar gelatin on Amazon – this package lasts forever! Prepare the sponge cake first. Preheat the oven to 350F/177C. Line the bottom of a 6-inch/15-cm round cake pan with parchment paper; don't grease the sides. 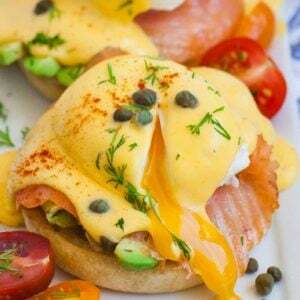 Place the eggs and sugar into a stand mixer bowl and whisk on high speed for 5 to 6 minutes, until the eggs are voluminous and pale in color. In a separate bowl, combine the flour and baking powder. Sift the dry ingredients into the eggs in small batches, folding gently but thoroughly. Pour in the butter last and fold in gently. 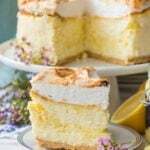 Pour the cake batter into the prepared pan and bake in preheated oven for 25 to 28 minutes, until the center is set and the top golden brown. Remove the cake from the oven and run a knife along the edge of the pan to release the cake from the sides. Allow the cake to cool completely, then split the layer into 3 or 4 layers. Next, prepare the gelee layer. Line the bottom and sides of a 6-inch/15-cm round pan with plastic wrap, creating a leak-proof seal. Pour the pomegranate juice into a small saucepan and add the sugar and agar gelatin. Cook the mixture over medium-high heat until the mixture comes to a simmer. Boil for about 30 seconds, then remove from heat. The mixture will start to thicken as it cooks. Pour the pomegranate mixture into the prepared pan, then carefully transfer into the refrigerator. The layer will set up in approximately 20 minutes. Once the gelee is set, use the plastic to remove the layer from the pan. Prepare an 8 or 9-inch (20-23cm) spring form pan to be used for assembling the cake. 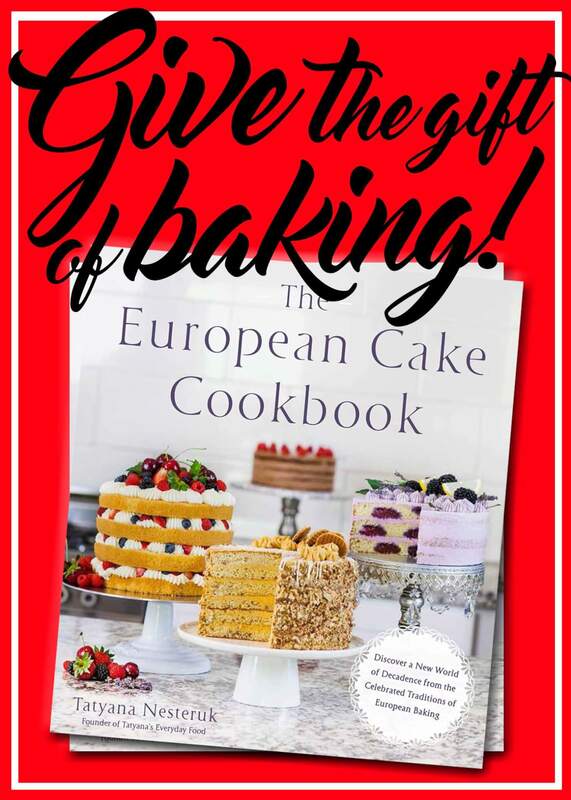 Line the sides with plastic wrap or an acetate cake collar; this will make it easier to remove the cake from the pan. Assemble the center first. Use a sponge cake layer as the first and second layer; soak each sponge cake layer generously with pomegranate liqueur using a pastry brush. Top with the gelee, then add the additional one or two cake layers. Next, prepare the chocolate mousse. In a large bowl, cream together the softened butter, sweetened condensed milk, melted chocolate, cocoa powder and vanilla extract. Mix for 2 to 3 minutes, until the mixture is smooth; set aside. Place the egg whites into a stand mixer bowl and whisk for 2 to 3 minutes until soft peaks form; set aside. Pour the water and agar gelatin into a small saucepan. Cook the mixture over medium heat until it begins to simmer and thicken, about 3 minutes. Begin adding the sugar, 1/2 cup at a time, and mix the sugar into syrup after each addition. Once all the sugar is added, continue cooking the syrup and bring it to a boil; boil for 2 minutes. Set the mixer with the egg whites to medium speed and pour the hot syrup in a slow and steady stream into the egg whites, avoiding the whisk attachment. Once all the syrup is added, turn the mixer to high speed. Mix on high speed for 6 to 7 minutes, until the meringue begins to thicken and cool. Add the chocolate mixture and lemon juice, then mix again for 2 minutes. Pour the chocolate mousse over the assembled center cake and along the sides. Work quickly as the mousse will begin to set quickly. 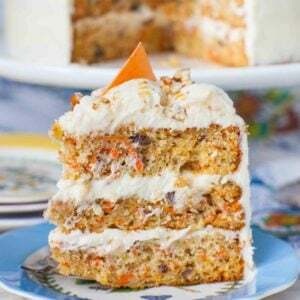 Use an off-set spatula to level off the top. Set the mousse cake into the refrigerator to set and chill for 1 hour. 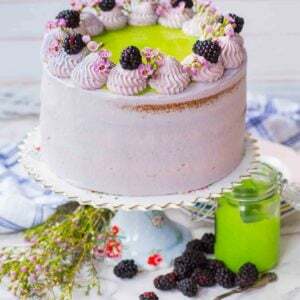 Once the cake is set and chilled, carefully remove it from the spring form pan and place the cake onto a wire rack arranged over a baking tray to catch any extra glaze. Prepare the glaze: combine the chocolate, milk and shortening in large measuring cup. Microwave the chocolate in 30 second intervals and stir well until mixture is completely smooth and clump-free. Allow the chocolate glaze to cool for 5 to 7 minutes, then pour over the cake. Use a flat spatula to spread the chocolate evenly over the top and sides. Garnish the top of the cake with melted white chocolate and pomegranate arils and pieces. Keep cake refrigerated. Can’t wait for the cookbook. You’re too kind! I try to eat everything in moderation and go to the gym a few times a week to stay in shape 🙂 I can’t wait for you to see the book! I’ve tried this recipe with regular gelatin but it doesn’t turn out quite the same. I made this cake for Thanksgiving dinner and it looks better than it tastes. The gelee has the strangest texture, all the guest left that part on their plates, and the mousse is very sweet! Does it really need 2 cups of sugar and 1 cup of condensed milk? All of that sugar is that for texture or for taste?